Each day, around 6,000 aircraft and 600,000 people fly above our heads in UK skies. At NATS we manage a complex ‘invisible infrastructure’ that helps a diverse variety of airspace users – including leisure, commercial, cargo and military users – to operate safely in the sky. Below is a brief guide to how the airspace managed – with a particular focus on the UK. For more detailed information, visit https://nats.aero and http://caa.co.uk. 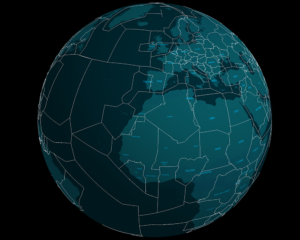 All airspace around the world is divided into Flight Information Regions (FIRs). Each FIR is managed by a controlling authority that has responsibility for ensuring that air traffic services are provided to the aircraft flying within it. The CAA is the controlling authority for the UK and NATS provides air traffic services for them. FIRs vary in size. Smaller countries may have one FIR in the airspace above them and larger countries may have several. Airspace over the ocean is typically divided into two or more FIRs and delegated to controlling authorities within countries that border it. In some cases, FIRs are split vertically into lower and upper sections. The lower section remains referred to as a FIR, but the upper portion is referred to as an Upper Information Region (or ‘UIR’). Airspace within a FIR (and UIR) is usually divided into pieces that vary in function, size and classification. 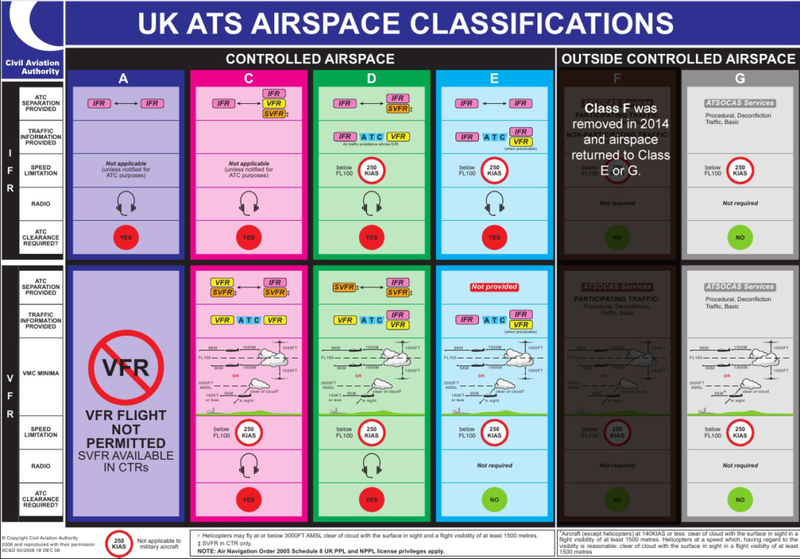 Classifications determine the rules for flying within a piece of airspace and whether it is ‘controlled’ or ‘uncontrolled’. Aircraft flying in controlled airspace must follow instructions from Air Traffic Controllers. Aircraft flying in uncontrolled airspace are not mandated to take air traffic control services but can call on them if and when required (e.g. flight information, alerting and distress services). 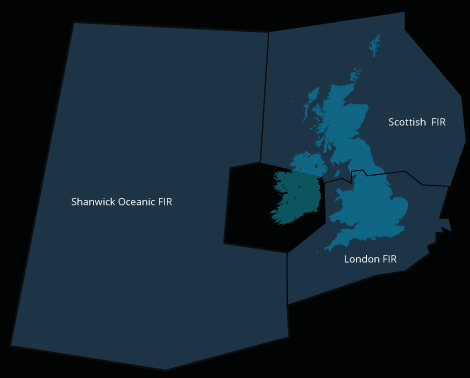 UK Airspace is divided into three FIRs; London, Scottish and Shanwick Oceanic. 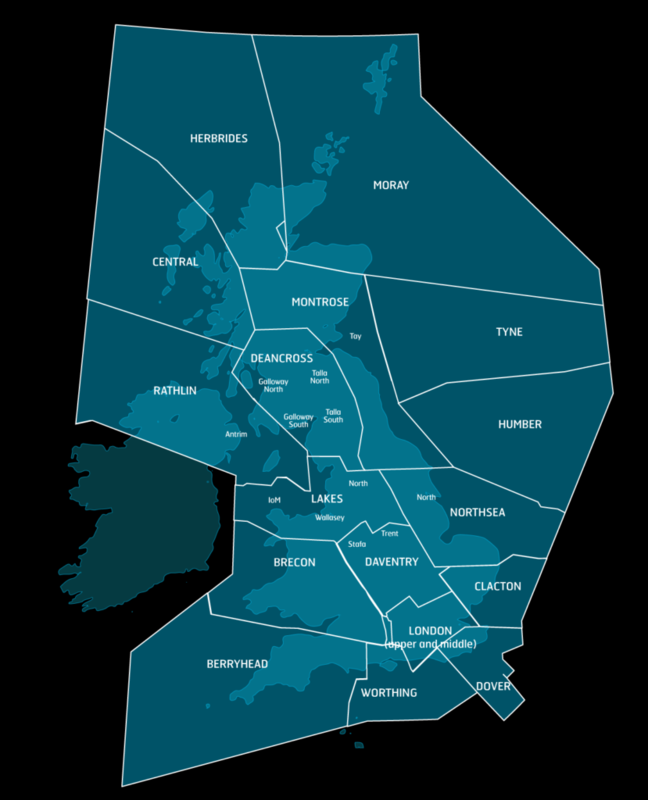 The London FIR covers England and Wales. The Scottish FIR covers Scotland and Northern Ireland. The Shanwick Oceanic FIR covers a region of airspace totalling 700,000 square miles over the North East Atlantic. NATS manages the airspace within these FIRs from two air traffic control centres – one in Swanwick (Hampshire) and the other in Prestwick (Ayrshire). The London Area Control Centre (LACC) which manages en route traffic in the London Flight Information Region. This includes en route airspace over England and Wales up to the Scottish border. The London Terminal Control Centre (LTCC) which handles traffic below 24,500 feet flying to or from London’s airports. This area, one of the busiest in Europe, extends south and east to the borders of France and the Netherlands, west towards Bristol and north to near Birmingham. Military Air Traffic Control which provides services to military aircraft (and civil aircraft when required) operating outside of controlled airspace. They work closely with civilian controllers to ensure the safe co-ordination of traffic. The Manchester Area Control Centre (MACC), which controls aircraft over much of the north of England, the Midlands and north Wales from 2,500 feet up to 28,500 feet. The Scottish Area Control Centre (ScACC), which controls aircraft over Scotland, Northern Ireland, Northern England and the North Sea from 2,500 feet up to 66,000 feet. The Oceanic Area Control Centre (OACC), which controls the airspace over the eastern half of the North Atlantic from the Azores (45 degrees north) to a boundary with Iceland (61 degrees north). In the UK there are currently five classes of airspace; A,C,D,E and G. The classification of the airspace within a FIR determines the flight rules which apply and the minimum air traffic services which are to be provided. Classes A, C, D and E are areas of controlled airspace and G is uncontrolled airspace. In addition to being given a class, which specifies rules for flying, controlled airspace may be further defined by its ‘type’ depending on where it is and the function it provides. Control Zones (CTZ). Aerodrome Control Zones afford protection to aircraft within the immediate vicinity of aerodromes. Control Areas (CTA). Control Areas are situated above the Aerodrome Traffic Zone (ATZ) and afford protection over a larger area to a specified upper limit. Terminal Control Areas are normally established at the junction of airways in the vicinity of one or more major aerodromes. The London Terminal Control Area is an example of this and deals with air traffic arriving and departing from London Heathrow, Gatwick, Luton, Stansted, London City, Northolt, Biggin Hill, Southend, Farnborough and other minor airfields in the London area. Airways. Airways are corridors of airspace connecting the Control Areas and link up with airways in other countries too. Airways are normally 10 miles wide and have bases usually between 5,000 feet and 7,000 feet and they extend upward to a height of 24,500 feet. Upper Air Routes. Upper air routes (UARs) sit above airways. Their vertical limits are usually FL 250 (25,000 feet) – FL 460 (46,000 feet). Civil and military aircraft operating above FL 245 (24,500 feet) are subject to a full and mandatory Air Traffic Control Service. All airspace above 24,500 feet is Class C controlled airspace. Restricted. Restricted areas (sometimes called ‘Danger areas’) prevent aircraft straying into dangerous places. Danger can come from airborne activities, such as military aircraft training or air-to-air refuelling. It can also come from the ground, such as from weapons testing ranges. 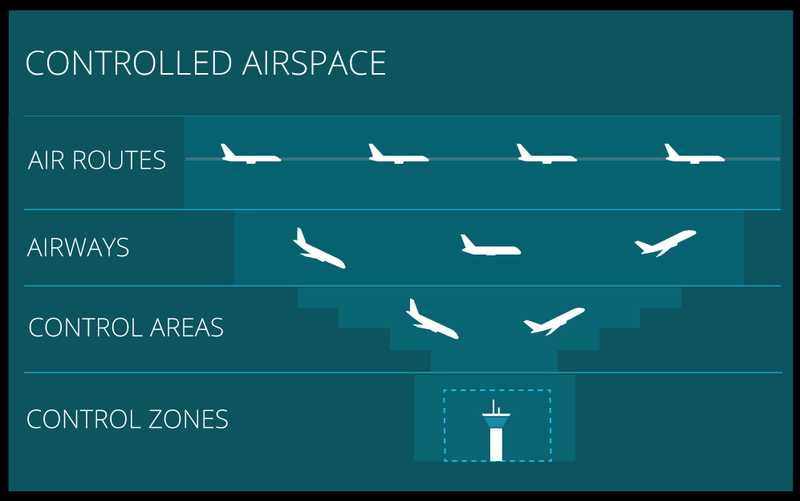 To ensure efficient use of the airspace, most Restricted areas can be deactivated when they are not in use, allowing other aircraft to then use the airpsace. To manage the airspace in a FIR, the company providing air traffic control services – often referred to as the ‘Air Navigation Service Provider (ANSP)’– will divide it into ‘Sectors’. These Sectors are like 3D jigsaw puzzle pieces with differing heights and sizes that interlock to cover the sky. Air Traffic Controllers (ATCOs) and Flight Information Services Officers (FISOs) are allocated to Sectors to advise and guide the aircraft flying in them. The number, type and skills of those allocated to a Sector will vary depending on the nature of airspace it covers (e.g. Class and Type as described above as well as how busy or complex it is). Airspace Sectors can be created and reduced dynamically to deal with demand. For example, in times when there are high levels of air traffic, more sectors may be opened with more Controllers allocated to manage the aircraft within an area of airspace. This is done to maintain safety as a Controller can only manage a certain number of aircraft at one time. In less busy periods, when there are low levels of air traffic, such as throughout the night, Sectors may be grouped or ‘band-boxed’, with fewer Controllers managing a larger area. Air traffic control over the North Atlantic is shared by the UK, Portugal, the USA, Canada and Iceland. NATS is responsible for managing the Shanwick Oceanic FIR which covers the Eastern portion of the Atlantic and stretches between latitudes 45 degrees North and 61 degrees North and westward to longitude 30 degrees West. This FIR is made up of 700,000 square miles of sky, and is the largest in Europe. Around 80% of all Atlantic Ocean traffic flies through the Shanwick Oceanic FIR. 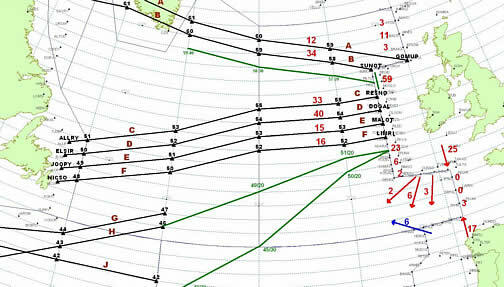 A system of routes or “tracks” for aircraft to follow over the ocean is designed every 12 hours. When designing the tracks, the prevailing wind is taken into account so aircraft can take advantage of tailwinds. This makes flight more fuel economical and gets the aircraft and passengers to their destinations quicker. NATS is responsible for the westbound track system (usually through UK airspace between 1000hrs and 1600hrs) and Nav Canada (the Canadian ANSP), for the eastbound track system. Clearances given by Air Traffic Control to pilots to cross the ocean will include details on the track an aircraft should follow, flight level, speed and time to join a track. Planners on either side of the Ocean consult with each other and co-ordinate as necessary to make sure aircraft entering and departing their FIRs can be handled and managed efficiently without overloading the airspace. In Oceanic airspace, routings and reporting are based on latitude and longitude. Every ten degrees of latitude pilots make a report giving present position, height and the next two positions that they are intending to route. The controller can check that the flight is routing in accordance with their clearance and amend or deal with any requests as required. Traditionally, pilot reports were made using radio on High Frequency to operators in Shannon, Ireland. However developments over the past 10-15 years mean that now 80% of pilots can make these reports via satellite links from the cockpit direct to the controller. Controller–pilot data link communication systems now enable the sending and receiving of text based messages, thus cutting out the requirement to make verbal reports.